Pesto pasta is known in various countries around the world thanks to an industrial production which allows you to store basil and pine nuts in glass jars ready to be enjoyed at any time of the year even when there is the snow. I personally believe that “Pasta al Pesto” should be enjoyed in the summer when basil is at its maximum flavor and is absolutely fresh. 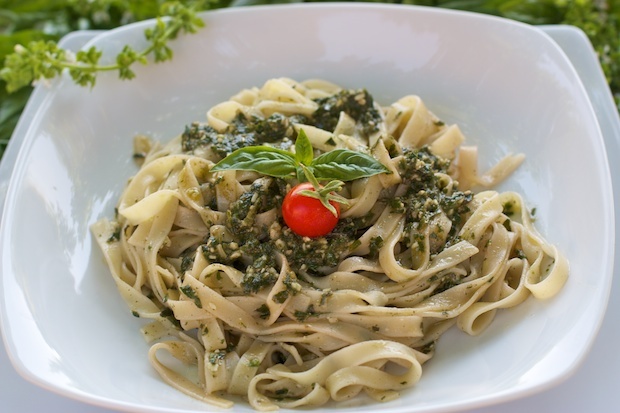 The ideal preparation for this sauce is to use a small mortar and pestle where you can mash together the ingredients allowing pine nuts, leaves of basil, and garlic to release their precious oils. This preparation requires a certain amount of time, so you can also simply mix the various ingredients in a blender at a low speed, one that allows you to retain a certain consistency, without it becoming a green uniform cream whose ingredients remain indistinct. The recipe was born in Liguria where the pesto has a special aroma. If you have a small space in the garden arrange some basil plants. Basil can be grown in pots on a terrace or balcony. It does not require great care, only a little watering. It also has a very positive feature because the more you pick off, the more it produces its leaves, so you can have a product available until the fog and the cold deteriorates it completely. In Liguria this preparation is made by boiling some potatoes that have been cut into small pieces and green beans into the water where the pasta is boiled, cooking them all together and seasoning them with pesto. Here is my recipe. If you have leftovers of this sauce, it can be kept a few days in the fridge in a bowl covered with plastic wrap. Boil the water with salt for the pasta. Wash the basil leaves and dry with paper towel or cloth to dry them. Blend at low speed for a few seconds. Pour the sauce into a bowl and cover with plastic wrap. When the water boils add the pasta. Stir with a fork and cook according to the instructions on the pasta package. When the pasta is cooked, mix the sauce with two tablespoons of the cooking water, drain and pour into a large salad bowl. Drizzle with the sauce, add the cheese and serve on individual plates.